Healing Heels: An In-Depth Look at Pre-Surgical Plantar Fasciitis Treatments - Healing Feet - NYC Podiatrist & Foot Doctor. Plantar fasciitis is hard to escape these days. The most common cause of heel pain, it is easily the most common type of musculoskeletal sports injury I see in the office. Whether you’re Peyton Manning, an ultra-marathoner, or a weekend warrior, it seems to affect people of all age groups, activity levels, genders, races, sizes, and shapes. It can be a quite debilitating injury with long delays in returning to your activity of choice. It can many times be stubborn and resistant to conventional treatments. First line treatments often include targeted stretching and strengthening exercises, rest, icing, and support for the fascia (in terms of strappings or orthotics). Many times we will add anti-inflammatory measures such as oral medications, topical medications, or steroid injections. Often these methods go a long way toward relieving symptoms. In the past, when these treatment methods failed, the final resort would be surgery. However, more advanced pre-surgical plantar fasciitis treatments have become available including extracorporeal shockwave therapy, MLS laser therapy, PRP injections, and the FAST procedure. Simply stated, the plantar fascia is a structure on the bottom (plantar surface) of the foot which originates on the heel bone, and runs along the arch of the foot, eventually splitting and sending slips to all five toes. The purpose of the plantar fascia is to help maintain the arch of the foot. Fascia is a tough tissue with some elasticity (picture a tendon rolled flat into a sheet). There are three main bands of the plantar fascia, and it seems to be the medial band (and sometimes the medial portion of the central band) closer to the inside of the foot which causes all the problems. Leading theories speculate that the fascia undergoes a series of micro-traumas resulting in small tears, usually close to the plantar fascia’s bony origin. Due to a notoriously poor blood supply, these tears usually heal with fibrous (scar) tissue which is denser and less elastic than the fascia is meant to be, and which ultimately leads to pain in the heel. This pain usually starts as pain after periods of rest, especially in the morning, but as the condition becomes more chronic, pain can occur throughout the day with increased activity. Extracorporeal Shock Wave Therapy (ECSWT): While the name may sound a bit medieval, this is a non-invasive therapy used for treating various musculoskeletal conditions and it has been shown to benefit plantar fasciitis patients. There are two forms of ECSWT, high energy and low energy. The high energy machine is used less often these days, and typically requires a local anesthetic to prevent discomfort. Most practitioners will use low energy therapy in their office, also known as EPAT (or extracorporeal pulse activation technology). Essentially, the machine has a handheld device which creates an acoustic pressure wave in order to stimulate local metabolism, increase blood flow, and boost anti-inflammatory factors. I often explain to patients that it’s a little like tricking the body into thinking there is a new injury somewhere in the body. By harnessing the body’s own healing response, ECSWT prompts the body to try to heal the area. Patients usually undergo 3-5 treatments, each about a week apart. There are no real side effects (although there can be some discomfort during or after treatment), and there are typically no activity restrictions. MLS Laser: Cold lasers or pain lasers have been in use for a while. New pain lasers (class IV lasers) are now used to treat a variety of musculoskeletal conditions. Essentially, the MLS laser uses specific wavelengths of light that have strong anti-inflammatory and pain reducing effects on tissues that are exposed to the laser. Painful conditions accompanied by swelling or inflammation benefit the most. Photons of laser energy penetrate deeply into tissues and accelerate cellular reproduction and growth (it is believed the laser increases the amount of ATP available to cells, essentially the cellular “energy currency”). The goal is to decrease inflammation and increase healing time. The laser has no known negative side effects, although patients are asked to wear protective eyewear during the treatment. Typically, patients will have 6-10 laser therapy sessions. Protein Rich Plasma (PRP) Therapy: This minimally invasive treatment method has gained a lot of traction in sports medicine in recent years. Again, tissues like the plantar fascia and many tendons and ligaments have a poor blood supply. 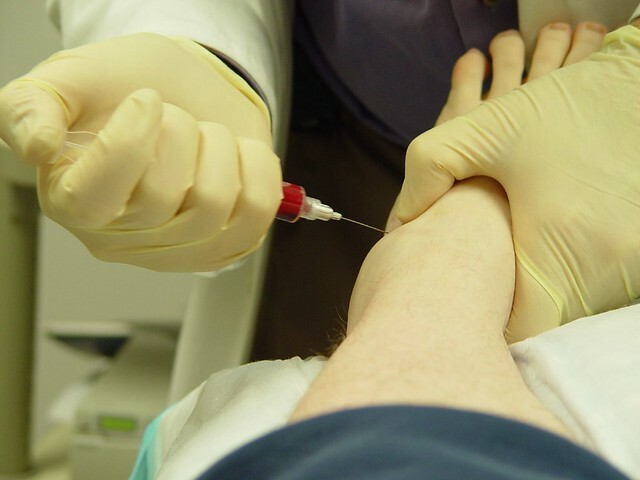 In PRP therapy, your own blood is drawn, and then placed in a centrifuge. The centrifuge separates the blood into several component layers, one of which is the PRP layer, which contains an aggregate of healing factors. The PRP is then injected back into an area of poor blood supply, in an effort to ramp up the body’s natural healing mechanism. The procedure can be done in the office or operating room. Most patients will wear a Cam walker for some time after the procedure (typically 2-3 weeks). The Fast procedure from Tenex Health: The last minimally invasive technique to discuss is one of the newest: the Fast procedure. Again, due to a poor blood supply, as the micro-tears in the fascia heal, they leave behind thickened, fibrous, scar tissue. Using ultrasound imaging, we are able to identify the exact area of diseased (thickened) tissue. A micro-incision is then made, and a specialized probe is inserted through the incision. We then use ultrasonic energy to break down and remove only diseased tissue without disturbing healthy tissue. This selectivity is a huge benefit of the procedure, along with the minimal incision and recovery time. Most patients will wear a protective boot for several weeks after the procedure. If you’re suffering from a stubborn case of plantar fasciitis that has not responded to more conventional plantar fasciitis treatments, don’t feel discouraged. There are several advances in technology that will get you back to your desired activity quicker than you think. To discuss your options with a podiatrist in Manhattan or Westchester area, visit our website or give us a call!